Pleade check out my fun PAID patterns as well! 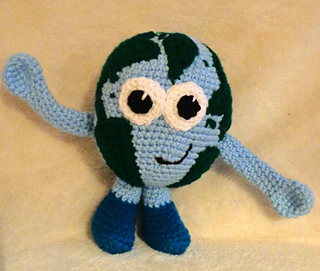 The “My Earth Buddy” pattern creates a cute little friend to remind our children to love our planet earth. It can provide an opportunity to teach our children about why the earth is important and what we can all do to care for and protect it. 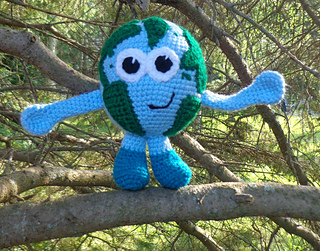 It can be a sweet souvenir or mascot for environmental awareness and Earth Day festivities. You could even add some eyelashes and a bow or flower, and make her into Mother Earth for a girl! 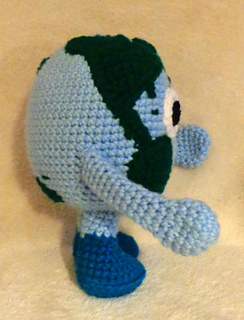 Please note that My Earth Buddy is not 100% geographically correct, and is intended as a child’s toy. The toy works up to approx. 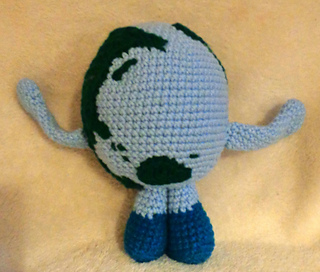 7.5” (19cm) tall, (or smaller with different yarn and hook sizes). Crochet Hook G (4mm) (or smaller), Red Heart Super Saver (or similar worsted weight yarn) in the following colors: Green, Blue, Black, White, and Shoe color of choice, Black yarn or embroidery thread for facial details, Sewing needle, Scissors, Polyfill Stuffing, Stitch Marker.